The Government of the Kingdom of Eswatini enacted the Construction Industry Act No 14 of 2013 that provides for the establishment of the Construction Industry Council and outlines its functions. The Council is now operational and implementation of the provisions of the legislation is underway. All companies and persons involved in construction are required by law among other things, to be registered with the Council. The Vision of the Council is, “To be the most competitive construction industry regulator in the region”. The Mission of the Council is, “To regulate, develop and promote the construction industry for the bene?t of all stakeholders through transformation for sustainable growth, monitoring industry performance, research and empowerment, thus improving the socio-economic status of the country”. Require any person or contractor to provide necessary records and information that will enable the Council to monitor the performance of the contractor. Consider any matter affecting the construction industry and make necessary recommendations to the Minister. Obtain information related to the industry from any person engaged in the construction industry in Eswatini. Obtain and collate information concerning any existing or proposed projects and where necessary, advise persons engaged in the construction industry on the project. To work together with the bodies in Eswatini and elsewhere on matters affecting the construction industry. To recommend the approval of institutions in Eswatini and outside for the training of persons engaged in the construction industry. To employ professional, technical and administrative staff as it may consider requisite and lay down conditions of services for the employees. Generally, to do such things as the Council may consider necessary or expedient for the performance of its functions under this Act. Promote and develop the construction industry in Eswatini, give priority to Swati Firms and Swati companies. Facilitate Swati Firm and Swati companies to have access to resources for the development of their operations. Assess the performance of contractors in the execution of contracts and thus provide a performance record for contractors. Regulate the behaviour and promote minimum standards and best practice for contractors. Provide data and the size and distribution of contractors operating within the industry. To Promote research, development and the use of competitive local materials and appropriate construction material. Set and promote safety standards in the construction industry. Prescribe the categories for the registration of persons engaged in the construction industry. Monitor and evaluate, from time to time, the capacity and progress of persons engaged in the construction industry. 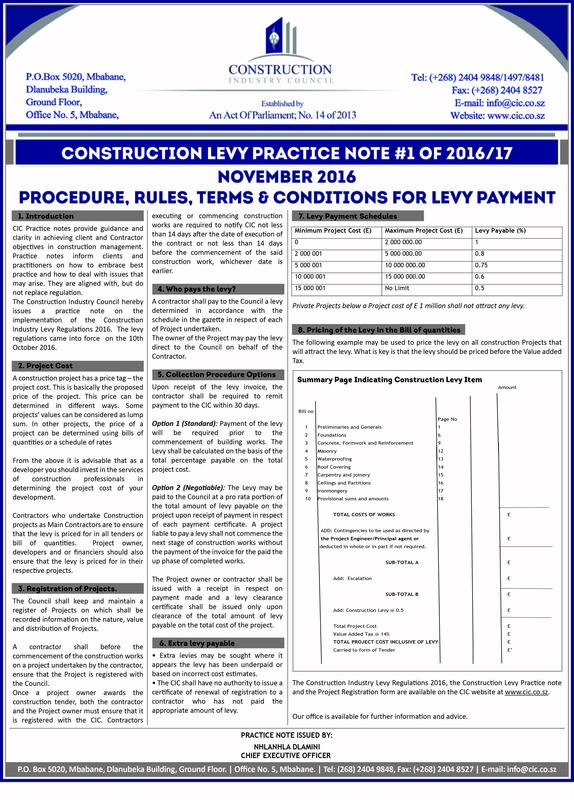 Regulate activities in the construction industry through the appropriate institutions, Boards and other authorities, as the case may be. Recommend to the Minister, the conditions under which a foreign ?rm or foreign company may be registered and permitted to operate in Eswatini.